Hybrid released its January e-newsletter today. 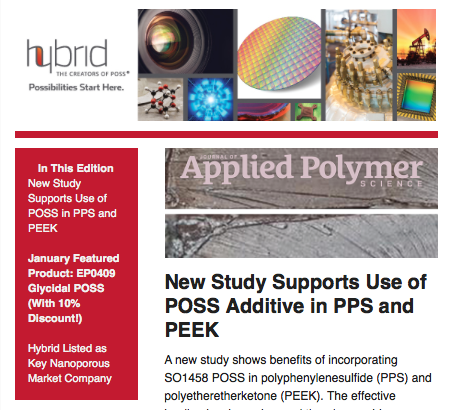 This month’s edition featured a new Journal of Applied Science article on the the benefits of using SO1458 POSS with polyphenylenesulfide (PPS) and polyetheretherketone (PEEK). January’s featured product is EP0409 Glycidal POSS. Those who mention the e-newsletter can receive a 10% discount on their order. Finally, Hybrid was named one of 12 companies worldwide listed in the 2017 Nanoporous Materials Market report. To access our January e-newsletter, click here.